Discussion is underway on a plan to redesign the Alamo. The City Council approved portions of the Alamo Master Plan, 9-2, including moving the Alamo Cenotaph, closing streets in front of the monument, and leasing Alamo Plaza land to the Texas General Land Office. The changes are part of an overhaul that could reach over $340 million. Councilmen John Courage and Clayton Perry represented the dissenting votes. District 3 Councilwoman Rebecca Viagran said her yes vote is to help ensure a more complete story of 1836 Battle of the Alamo is told. "By saying yes, we are saying there is value to telling those stories of the Tejanos and the indigenous people," she said. "A vote yes will allow us to reclaim our stories and our space." The plan also calls for the creation of a museum across from Alamo Plaza. While there will be an entrance fee for the museum, access to the plaza and the church will remain free. The master plan has now passed through several committees, been signed off by San Antonio Mayor Ron Nirenberg and Land Commissioner George P. Bush, and has been approved by the City Council. “Now begins the real work of designing, constructing, and programming a world-class historic site and a museum for the Alamo,” Nirenberg said. The decision on where to place the Cenotaph, the design of the plaza, and the creation of the museum will all require separate approvals from agencies including the Texas Historical Commission and San Antonio’s Historic Design and Review Commission. 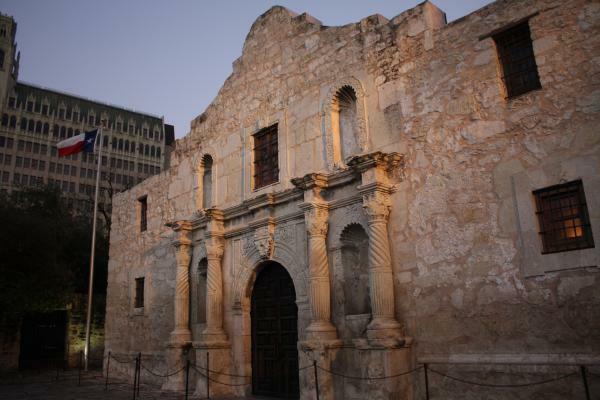 If all approvals go forward, renovations are expected to be completed in time for the Alamo’s 300th anniversary in 2024. 5:08 p.m. — San Antonio City Council approves portions of Alamo Master Plan, 9-2, including moving the Alamo Cenotaph, street closures, and leasing Alamo Plaza land to the Texas General Land Office. Councilmen John Courage and Clayton Perry voted against the plan. 5:03 p.m. — Roughly five hours after discussion began, Nirenberg calls for a vote. 4:53 p.m. — Councilwoman Ana Sandoval and Councilman Greg Brockhouse both say they will be supporting the plan. A vote appears imminent. 4:20 p.m. — The motion fails 2-9. Discussion continues. 4:10 p.m. — Councilman Clayton Perry is making his own motion to change how access to the plaza would work. "Pedestrian access shall not be limited to less than six access points" at all times. It's seconded by Courage. 3:45 p.m. — Council votes on Courage's amendment. It failed by a 2-9 vote. 3:41 p.m. — Councilman Greg Brockhouse Trevino asks what impact changing the lease agreement would have on the overall plan. Trevino says it would prevent much of the plan from moving forward. Brockhouse says the amendment proposed by Courage is "a poison pill." 3:35 p.m. — Councilman John Courage moves to amend the lease agreement. It's seconded. The discussion has now shifted to changing the lease. 3:30 p.m. — Councilman Robert Trevino makes a motion to approve the Alamo plan. It's seconded. 3 p.m. — Public comment has ended. The City Council begins the discussion. 2:45 p.m. — The San Antonio City Council continues the discussion about the future of Alamo Plaza that began around noon. The city of Dallas made history this month as the first Texas city to get state recognition for its LGBTQ neighborhood. An official historical marker was installed in front of JR’s Bar & Grill in Oak Lawn. Five stories that have North Texas talking: Austin and Dallas are looking for a new police chief and city manager at the same time; “Mexican American Heritage” isn’t the first inaccurate textbook written for Texas classrooms; tonight's State of the Arts will trace Fort Worth’s musical history; and more.